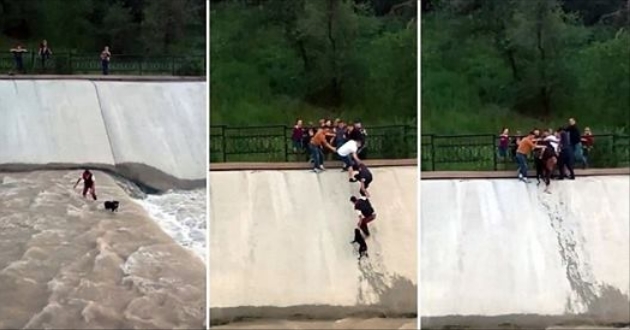 This is the heart-warming moment where five friends link hands to rescue an inquisitive puppy from a reservoir. The young dog got too close to the Sayran reservoir in the city of Almaty in south-eastern Kazakhstan and fell in. The frightened animal was struggling to hold its footing in fast-flowing water - and was only inches away from a dangerous weir. Fortunately, it was spotted by a group of friends out walking nearby who staged a courageous rescue bid captured by eye-witness Marjana Khadreeva on her smartphone. Her video begins with one man bravely wading into the water, grabbing hold of the dog - believed to be a stray - and pulling it to the bank. But he then found himself unable to get the exhausted puppy up the steep concrete sides of the reservoir. So four of his friends linked hands to form a human chain reaching from the railings at the top of the bank right down to the waterside. After a number of attempts, they eventually managed to reach the man holding the dog and quickly pulled them both up the sharp incline to safety. Responses to "Five friends link hands to rescue a distressed puppy from a reservoir"